Almost four years after its initial debut, I have finally downloaded The Sims 4. The additional expansions offered for The Sims 4 have not, until this point, been enough to get me to move on from The Sims 3, but with the promise of legacy content in the recent release of the Seasons expansion, I figured now was a good time to jump in. In the past, especially in The Sims 3, expansions transformed the entire game into a new experience. The overwhelming amount of additional post release and in-store content for The Sims meant there are lots of conflicting features to keep you busy if you get bored. It’s a huge part of the appeal—the ability to live out real world fantasies in a virtual setting free of logistic limitations. But what happens when an expansion stands alone on its own feet? Does it hold up? Are there are actually enough features there to justify the price? This is the third time Seasons has made an appearance in The Sims; the first, in The Sims 2, added gardening to the game, changing the series forever. I no longer remember a time when I wasn’t carefully planting crops and making recipes with my own vegetables, or supplementing my Sims’ income by selling what I grew. It was especially rewarding in The Sims 3, with my Master Chef aspirations, which allowed me to live out my real world passion of cooking with my own produce. It makes sense that I didn’t pay attention to The Sims 4 until Seasons was announced, because frankly, I refuse to play it without the gardening feature. To say it is essential to The Sims is an understatement. With Seasons, the gardening system comes with a few upgrades. You can now look at the plant’s description as it grows to check that it’s in season. As with previous installments, the weather of whatever season you’re in will affect growth rates, and you can water and weed and fertilize with a variety of plants and fish. Also available now is the profession of Botanist, which allows you to study the crops for more information as you go, and Florist, which lets your Sim learn how to arrange and sell bouquets from flowers grown in the garden. 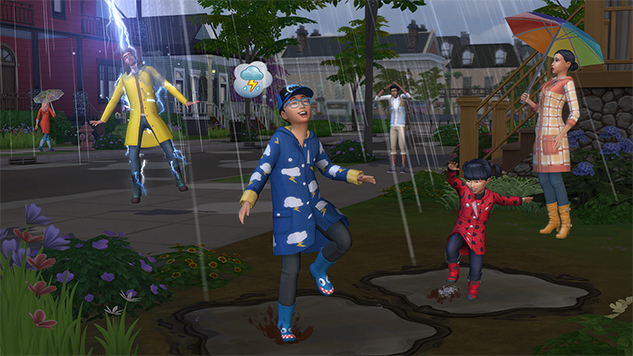 As for the weather features, it’s definitely nice to have rain or snow or sunny days, in that they give your Sim different obstacles and moods to attend to as they go about their day. The special holidays, though, without the other expansion content (and especially early in the game) feel lonely, even hollow, as if your Sim is going through the motions. The timing of the holidays makes them also feel almost as though they’re on top of one another. In the future I might extend the length of each season, so it doesn’t feel like an entire year happens in a month. While the base Seasons experience hasn’t been improved or built upon too much, I did enjoy some of the novelties that are specific to the expansion. For example, once I realized that the game’s fictionalized take on Santa Claus, dressed in a pseudo-Saint Nicolas style suit, makes house calls on “Winterfest” night, I decided to seduce him and see if I could get pregnant. Not only did I succeed, making Santa Claus my Sims’ first kiss and first WooHoo, I found out he’s a bit of a deadbeat. While the guy I was dating came over the day after I gave birth to helpfully wash all the dishes and change diapers, Santa has only visited once, playing videogames for 5 hours and leaving a tea cup on the floor. After that I asked the other dude to move in, because if I’ve learned anything from rom coms, it’s that you always wind up with the guy who was there for you without even asking. Wacky antics and novelty aside, though, I expected I would need more time with the Seasons expansion to get a full sense of everything it offers, especially because I’d yet to play The Sims 4. However, a few hours of play was sufficient. The experience isn’t robust enough to need more than that. And while at first I thought it was perhaps unfair to base my review on an experience stripped down to the base game and only one expansion, given that EA has taken to suggesting that users only keep one expansion active at once (or at least, they did during The Sims 3), it might actually be the most honest way to do a review. It gives me a chance to isolate the features of Seasons and see how much they really add, or don’t add, to the game, without getting an inflated sense of depth. What I’m left with, in terms of Seasons, is an expansion that feels less like the transformative events of games past, and more like a stuff pack, adding a few new items and features but not constituting what once felt like an entire new game in and of itself. Maybe that’s why reviewing an expansion that I’ve played in two other full Sims games seems so empty. I’ve come to expect Seasons, so it’s hard to feel grateful for it, especially given the wait time. At this point, full seasons and weather cycles feel like they should be a core part of the base game; they don’t justify an entire $40 expansion pack alone. After all these years, the Seasons expansion should feel fuller than this. Like many others, I did not really move on from The Sims 2 to The Sims 3 until Supernatural came out, and I find it baffling that Seasons was released this late in the cycle for The Sims 4, given how much of a staple it is to the Sims experience. It’s been almost four years, and looking over all the official content packs to come out for the game so far, I still see hardly anything worth purchasing. Ultimately, while I appreciate the content that Seasons adds, I’m starting to think that The Sims 4 was designed not with the “base” standard content that fans have come to expect in mind, but rather, redesigned from the ground up. I also feel as though The Sims has been stripped down for parts and sold off piece by piece, and I wonder how much longer they’re going to draw this out. Not only has their new monetization plan slowed down the Sims release cycle, in some ways it’s turned The Sims into more of a domestic simulator than a fantasy world. Without the chaos of conflicting expansions, it doesn’t feel “full” or messy, it just a game that sadly mirrors my real life, an endless cycle of dirty dishes and only leaving the house for work. I plan to keep up with The Sims 4 from here on out, but catching up is a different story. Outdoor Retreat and Jungle Adventure look good, but of the 14 stuff packs, only two seem interesting. After almost four years, it still feels like EA has catching up to do in terms of the legacy of the The Sims 3, and these skimpy expansions and dull content packs aren’t helping. In the case of Seasons, it may be too little, too late. The Sims 4: Seasons was developed by EA Maxis and The Sims Studio and published by EA. Our review is based on the PC version. It is also available for Mac.